Researchers at North Carolina State University have developed a new technique to 3D print silicon paste, which relies on the same principles that allow sandcastles to hold together. 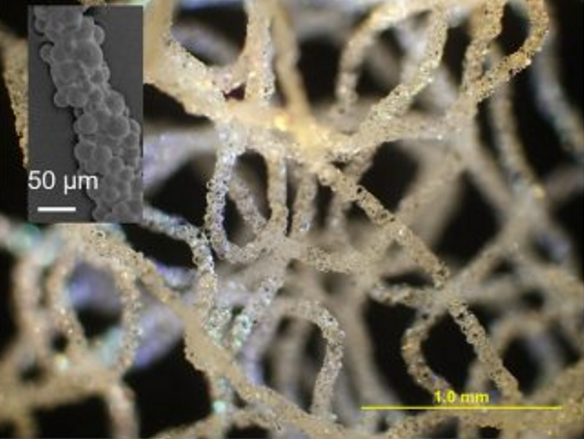 Published in Advanced Materials, the work involved printing silicon rubber structures by combining water with solid and liquid forms of silicon into a pasty ink. When printed, the team found that the liquid silicon rubber acted as a bridge for the tiny silicon rubber beads, helping to link them together like water helps sand particles bind in sand castles. According to the researchers, the resulting flexible and porous structures could have biomedical applications and uses in soft robotics. As the technique works in wet and dry environments, the team believes it has the potential to be used in live tissue, such as for flexible meshes or soft bandages that could be applied or even printed directly on the human body.